JVS hydraulically actuated gate valves are designed as a combination of the field proven manual gate valve with a double acting hydraulic actuator. The valve is full-bore and through conduit. It is available in standard double flange, threaded end or special block body configuration. 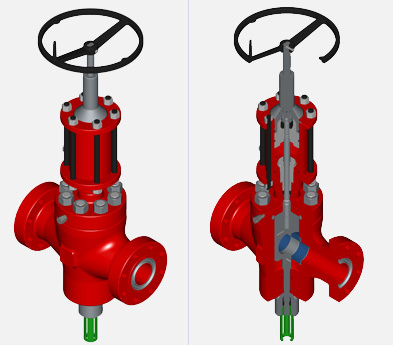 The hydraulic gate valve is fitted with a balancing lower stem to work in conjunction with a double acting hydraulic actuator which provides positive, reliable control through the entire stroke of the valve. Should a failure of hydraulic power occur, this valve will remain in position. A double acting actuator with a spring return feature is also available to achieve a failsafe (close) position.